Back in September I attended a blogger preview of the Lush spa experience evening at Lush Meadowhall and the treatment that I received was the Validation facial (you can my post on the evening here). Part of the facial involves using a face mask and the one I went for was Oatifix. I actually had five empty Lush pots with me to return in exchange for a free face mask, so I decided to take an Oatifix home with me. In case you're not familiar with Lush face masks these are supposed to be kept in the fridge, so that's why my pot is covered in condensation (I'd taken it out of the fridge to take the picture). 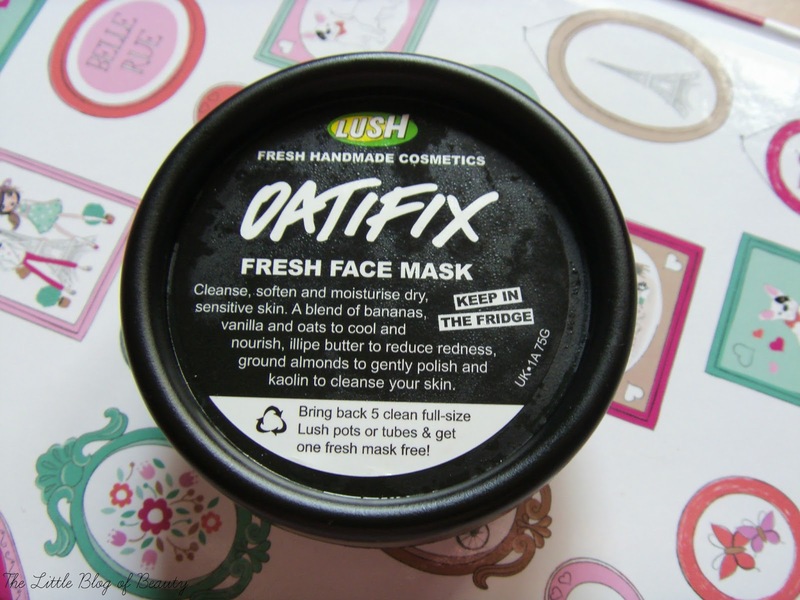 Oatifix contains fresh bananas and something called illipe butter to moisturise dry skin. 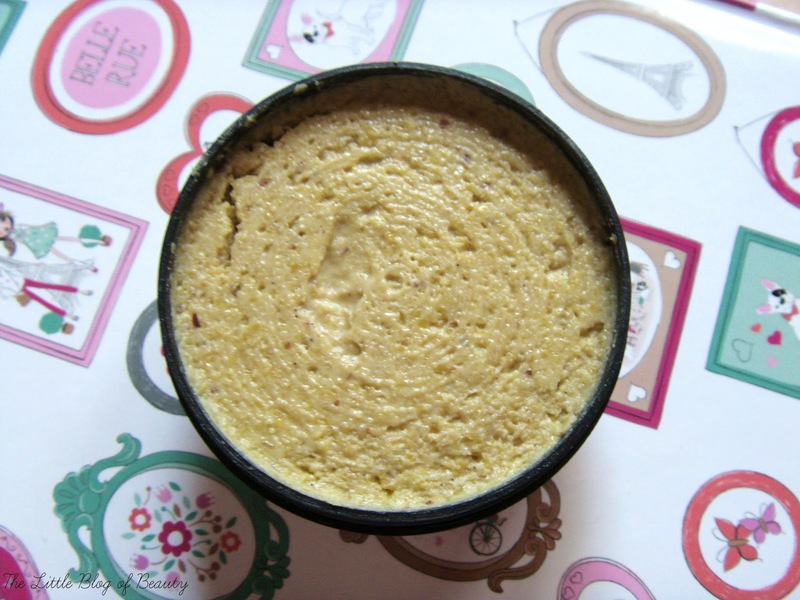 It also contains oatmeal, ground almonds and kaolin to work together in a mildly exfoliating base to help remove dead skin leaving your skin soft, supple and moisturised. Finally there's also fair trade vanilla absolute and sandlewood oil in there. While I was sat wearing this is Lush Meadowhall I was delighted to discover that it smells like flapjacks, so I knew I had to take some home with me to try out. When this was removed in the Lush store the lady used cotton pads and a toner water, but she did tell me that in the proper full facial it's removed with a warm cloth. This is important, as you will discover shortly! The first time I came to use this I discovered it's actually quite difficult to use. You can't really tell from the photo but this is like a kind of thick porridge suspended in an oily base. When you apply it to your face the oil spreads around quite easily, but the oaty thicker part of the mask tends to ball up and refuse to stick to your skin. You have to try and kind of smear it on, pressing it onto your face to try and make it stay in place. When it comes to removing this you hit another problem. I usually remove face masks by splashing my face with water repeatedly until it's all gone, maybe using my hands to rub slightly if required. The first time I tried to remove this one it became apparent quite quickly that the oaty parts that I'd had trouble getting to stick to my face were now 'welded on'. One it's in place it really does stick. So I've found the only way to remove this properly is to use a muslin cloth or flannel, which also helps to remove the oily base that is also quite stubborn. I do really like this mask, it smells amazing and it does work well on my dry skin leaving it soft and moisturised, but I'm just not sure I can be bothered with how difficult it is to apply and then remove afterwards. Also I've noticed that no matter how much I wipe around the top of the pot it keeps oozing some of the oil out, which makes an oily ring in the fridge that I'm not sure my mum has spotted yet! I do like Lush face masks, but I'm not sure this one is for me. Have you tried any Lush face masks?